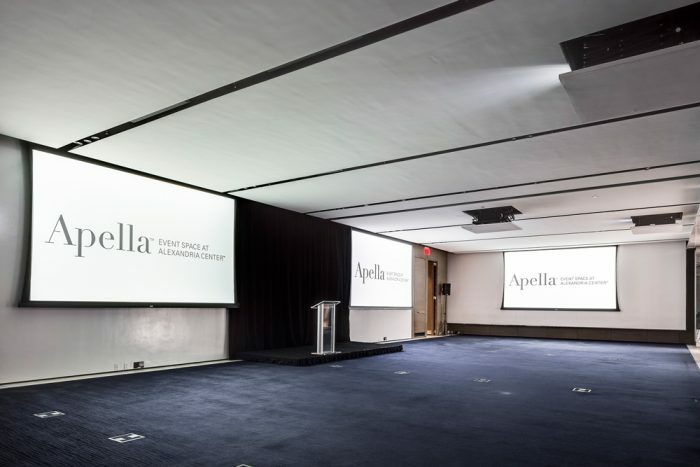 New York, NY – Apella, Event Space at Alexandria Center, New York City’s leading innovative meeting and events facility with expansive East River views, announces a major upgrade to its state-of-the-art technology. 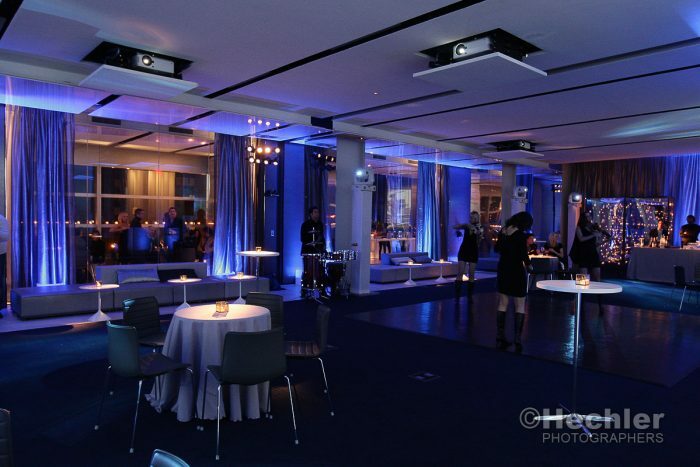 As the first event venue space in Manhattan to install laser-illumination projectors, Apella will remain a leader in technology for years to come as more advanced video projection, audiovisual distribution and broadcast production technologies are available. “In today’s competitive climate, the use of cutting-edge, state-of-the-art technology is crucial when hosting meetings and gala events," says Jamie Dembeck, Apella’s Director of Technology. “We invested in this significant AV upgrade to provide our sophisticated corporate and social clients with the technology that they need." Apella worked with AV and technology firm Conference Technologies, Inc. to make key upgrades including three of Digital Projection International’s 11,000 lumen HIGHlite Laser projectors that project onto three 188-inch screens in the Apella 200 event space, the largest of Apella’s ten meeting rooms that can accommodate 250 theater-style and 300 for a cocktail party or social event. The HIGHlite Laser projectors use an innovative, new laser-illumination technology to produce ultra-bright, accurate images suited for military simulation, medical and scientific visualization, major theatrical productions, and other high-end events where detail and color accuracy is critical. A highlight of Apella 200 is its large glass walls overlooking the East River. These new projectors create presentations that can be viewed in bright light. "In the past, it was difficult to see projected images during the morning when the sun is very bright,” explains Dembeck. "The extraordinary quality of the new projectors means that it is not necessary to drop the blackout shades or turn off the lights in the room. The presentation is crystal clear, the colors are vivid, and it’s so much easier to use our facilities without losing our signature view." Apella, Event Space at Alexandria Center for Life Science is a leader in innovative meeting and event spaces in New York City. 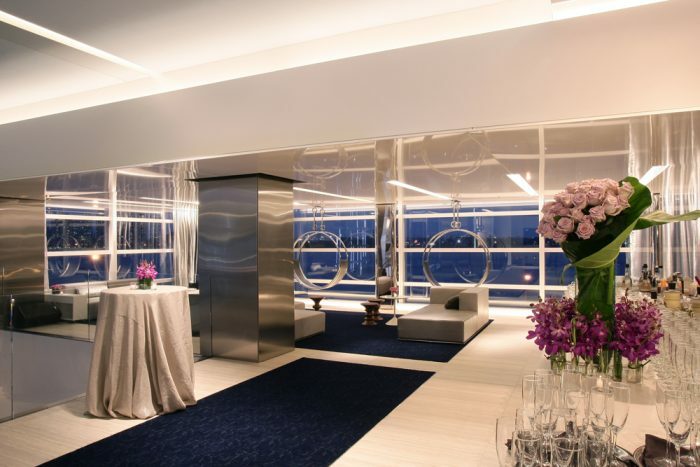 Accommodating up to 300 guests and offering ten thoughtfully designed private rooms, Apella features sweeping views of the East River and Manhattan skyline. Since its opening in 2010, Apella has been hosting the world’s greatest intellectual and creative minds for summits, conferences and events. Arthur Backal, CEO and Founder of Backal Management Group that manages all events at Apella and oversees the catering operation of the Mandarin Oriental New York, has worked with some of New York’s most renowned hotels including The Pierre and The Plaza, and he spearheaded the re-opening of the St. Regis, overseeing the food and beverage operations and serving as the director of catering.